Xia Xia Zhang Celebrates First Commercially Released Single "Cesar Franck: Violin Sonata in A Minor: II. 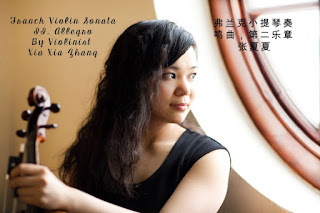 Allegro"
Xia Xia Zhang, recipient of the Global Music; Gold Medal “Emerging Artist” Award, as well as numerous other worldwide accolades, has commercially released her rendition of Cesar Franck’s Violin Sonata in A Minor: II Allegro. Her seven minute, forty-two second long single can be purchased and downloaded on CD Baby. The Franck Violin Sonata by Cesar Franck is one of his best-known compositions, and is considered one of the finest sonatas for violin and piano ever written. This sonata was written in 1886, as a wedding present for violinist Eugene Ysaye.